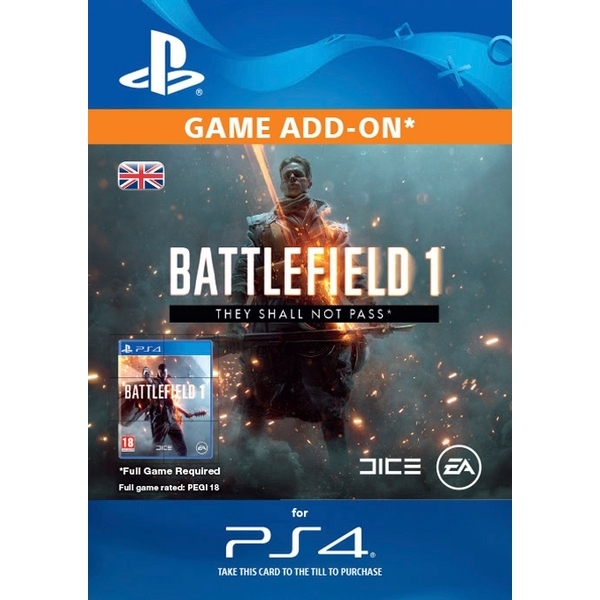 Battlefield™ 1 They Shall Not Pass* is the first expansion pack for Battlefield 1, available standalone or as part of Battlefield 1 Premium Pass. Play as one of the most ferocious armies in WW1 – the French. Engage in the savage fighting around the furnace of Verdun, and descend into the bowels of Fort de Vaux where barbarous battles rage in the gas-filled corridors. Take advantage of the mechanical monsters and unique arsenal by the Aisne riverbanks in the largest tank assault of the war. The French adopted a new battle cry during the war: They shall not pass! * The hardened and fearless French Army * 4 new multiplayer maps on the Western front * 2 epic Operations: The Devil's Anvil and Beyond the Marne * The new game mode Frontlines * 6 unlockable primary weapons * The Char 2C Behemoth tank and the St Chamond assault tank * The Trench Raider Elite class and more.